For some time, we at Great British Chefs HQ have spent our final hour of work on Friday sampling some of the nation’s finest beers, due to a love of anything great going on in the food and beverage world and, well, the thrill of cracking open a beer at your desk. It’s only right, then, that we now share some of our beery adventures with the world. Every two weeks, we’ll be taking you through some of our favourite beers. This week, we focus on Pressure Drop brewery. ‘Pressure drop, oh pressure drop, oh pressure’s gonna drop on you’ sang Toots and the Maytals in their 1969 ska classic. And so last week, two big boxes of beer from Pressure Drop brewery dropped into our office. Founded in 2012 by Graham, Sam and Ben in the humble surroundings of Graham’s garden shed, they are now producing some of the beer world’s most well-loved beers from their brewery in a railway arch in Hackney Downs, London. On any normal order, I’d plump straight for a big old case of Pale Fire – one of the finest pale ales around that is increasingly popping up as a keg staple in London’s craft beer pubs. However, due to its enormous success, stock levels were low, so we were grateful to receive two bottles in the mixed case. You never know quite what you’re going to get with Pale Fire, as they experiment regularly with different hop combinations, but I’ve never had a bad pint of it. Expect a seriously easy-drinking beer with assertive but not cloying citrus hops and a touch of the tropical with hints of passionfruit and mango. A lovely brew. 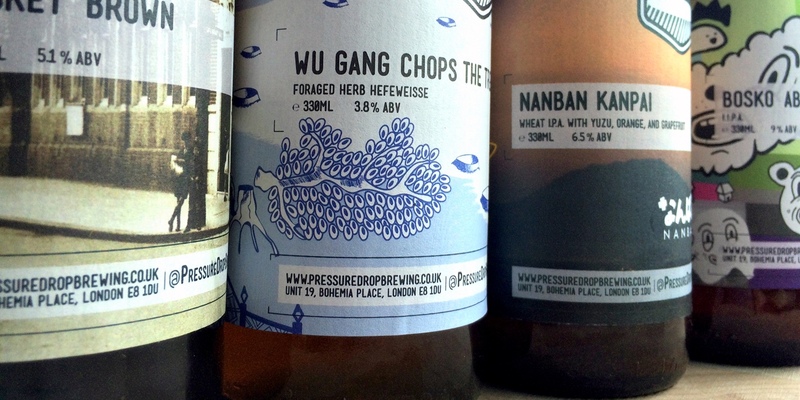 Another perennial favourite from Pressure Drop is Wu Gang Chops the Tree, a wheat beer with a difference named after a Chinese proverb about a poor chap called Wu Gang who chops down a magic tree, only for it to stubbornly spring back up again after every chop. Poor Wu Gang. While the proverb has become shorthand for ‘endless toil’, the beer version is a delightfully quaffable drop, but with enough foraged herbs adding to the regular clovey, sweet full-body of Hefeweisse to keep things interesting. And now for something completely different, the murkier, more sticky and sweet Nanban Kanpai, a collaboration brew with sprightly beer enthusiast and owner of Nanban restaurant Tim Anderson. While Pale Fire and Wu Gang offer a fizzy and light drinking experience, Nanban is a much thicker, juicier brew, infused with ingredient du-jour yuzu. This is a beer for those who like tropical fruit and don’t mind a lack of carbonation in their beers – it’s a sweet hazy treat. It’s Bosko Absoluto, a 9% IIPA (when a single IPA just isn’t enough) that would give any Friday afternoon work drinker the heebie-jeebies, so much so that no one has dared open one yet so I cannot give an office-beer perspective. Before moving on to the two, more terrifyingly ABV’d beers hiding in the fridge, it’s worth a mention of the delicious Stokey Brown. It can be a struggle to encourage people to drink brown or dark ales in the height of summer, but this generally hopped brown ale offers a hit of bitter refreshment on top of the toasty caramel malt flavours. Don’t let people tell you that you can only drink lighter shades of ale in summer – they are lying to you. First they gave us Bosko, the turbo-charged, hop-rich, malty IPA, an ode to all of those sticky-as-they-are hoppy American IPAs that are well and truly form the bedrock of many of the new wave of craft breweries in the UK. Bosko is a delight, and for something so punchy, surprisingly easy to drink. Where do you go from Bosko, though? It’s Bosko Absoluto, a 9% IIPA (when a single IPA just isn’t enough) that would give any Friday afternoon work drinker the heebie-jeebies, so much so that no one has dared open one yet so I cannot give an office-beer perspective. However, after a slurp of it in a local beer pub recently, I can testify to the fact that it’s a resinous, piney, herbaceous and sticky double IPA, with an overwhelming sense that yes, if you drink it too quickly then this beer is likely to floor you within 40 minutes (but in a good way, honest). 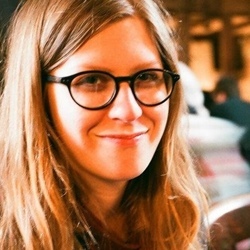 Keep an eye out for more Great British Chefs craft beer analysis in two week’s time, when we’ll be tucking in to a shipment from the mighty Buxton Brewery, and I’ll be testing my colleague’s patience by ordering a load of sour beers.